Published: Aug 9, 2018 · Modified: Apr 11, 2019 · By Jen Sobjack · This post may contain affiliate links. 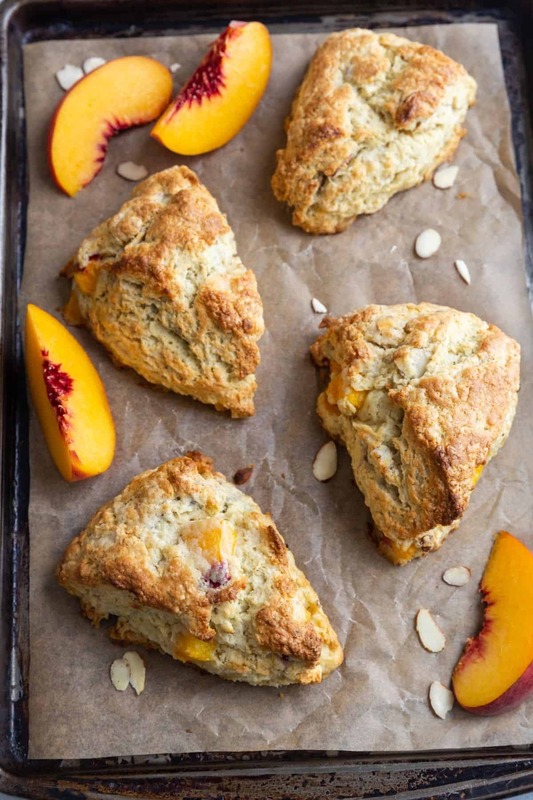 Loads of juicy peaches and almonds take these homemade peach scones to a whole new level! They’re moist, tender, and have chunks of peaches in every bite. Topped with a thick, sweet almond drizzle. This post has been updated with new content and photos. The original post was first published August 22, 2014. Did you know that August is National Peach Month? I’ve been thinking of nothing but peaches and what different recipes I can create with them. So far there’s peach ice cream, peach pound cake, and peach blueberry galette on the blog. But I was craving a scone. A peach one! With a soft center, crisp edges. One that is moist and flaky. Maybe a bit like cake but crumbles lightly. A scone that you are sure to never forget. Your house will smell like a peach cobbler while these beauties bake up. I was salivating. It made the first bite so much sweeter! The sweet almond glaze takes this scone right over the top. It’s a simple glaze with powdered sugar, heavy cream, and almond extract. Don’t be afraid to layer on the glaze. The almond flavor pairs so well with the peaches. 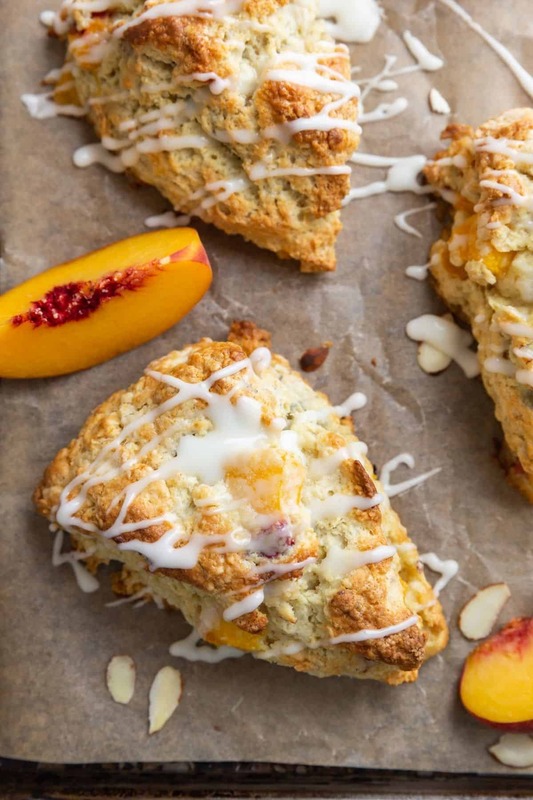 These peach almond scones are irresistible. You can glaze them while they are still warm and the glaze will melt, seeping down into the scone. Or wait until they cool before glazing. The glaze will set up nice and firm on top of the scones, leaving you with a beautiful presentation. Can I use frozen peaches in peach scones? This recipe calls for fresh peaches but frozen peaches can be used. There’s no need to thaw them first but they do need to be diced small. Frozen peaches can be challenging to cut through so be extra cautious if you choose to do this. 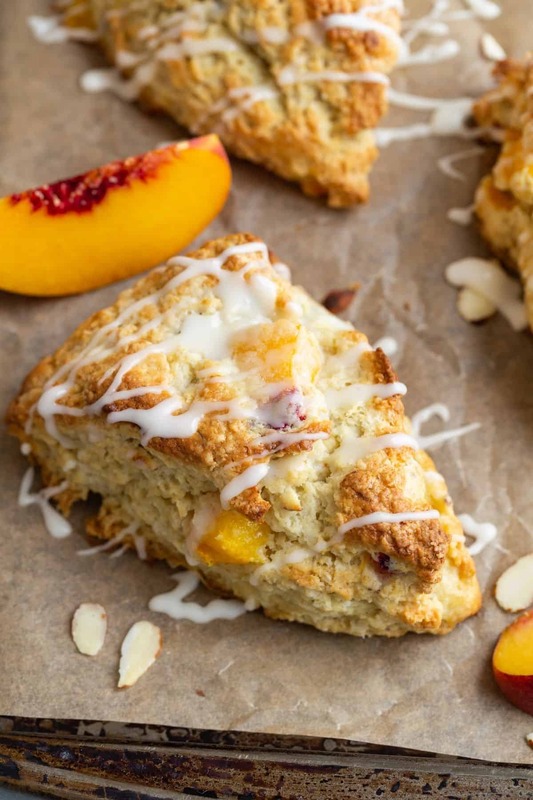 Regular yogurt will work great for this peach scone recipe. And to get more flavor, try using peach yogurt. Peaches – For the best flavor choose fresh ripened peaches. Peaches are in season June through August but of course the later in the season, the tastier the peaches! Cold butter – Always work with cold butter. It helps keep the scones tender and flaky. Buttermilk – I use buttermilk for all my scone recipes now because it creates such a wonderfully textured scone. It also works with the baking soda and powder to give the scones a beautiful rise. 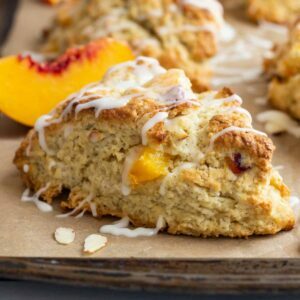 How to make peach scones with almond glaze? Use a pastry blender to cut butter into the flour mixture. Toss in diced peaches and almond slices. Add just enough of the buttermilk/egg mixture to moisten the dough so it holds together. Knead the dough and press it into a 7-inch round circle. Cut the circle into 8 triangle shaped wedges. Freeze the wedges for 30 minutes then bake at 400°F for 15-20 minutes until they are golden brown. Let them cool slightly then top with almond glaze. Freezing the wedges helps to ensure the butter is super cold and the scones bake up tall and stunning! The dough can handle some kneading but be careful to not overwork it. Handling the dough too much can result in tough, chewy scones. Fresh or frozen peaches work best for this recipe. Avoid using canned peaches as they are too soft and wet for the scone dough. You may not need all the liquid called for in the recipe. Add just enough to bind the ingredients together. The dough shouldn’t be wet and sticky. Freeze the scones before baking. Preheat the oven while the scones sit in the freezer for about 30 minutes. Freezing the scones helps to ensure they won’t spread a ton as they bake. 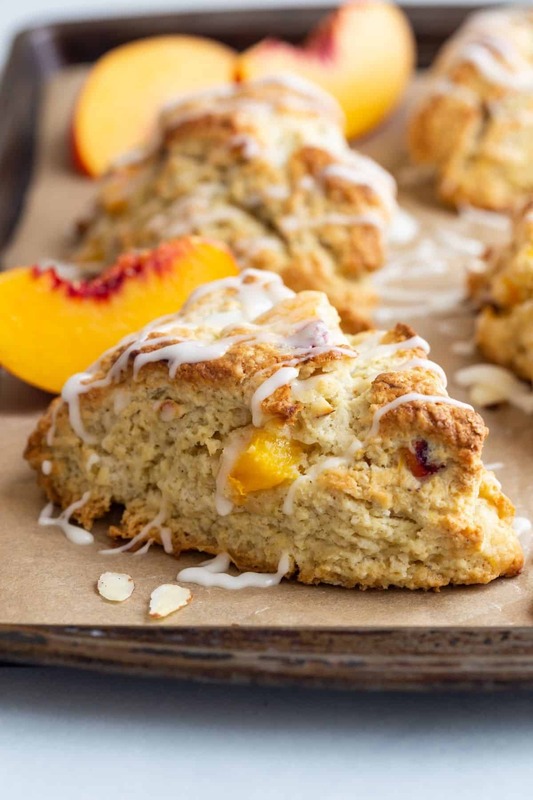 Loads of juicy peaches and almonds take these homemade peach scones to a whole new level! In a large bowl, whisk the flour, sugar, baking powder, salt, and baking soda, together. Cut the butter into the flour using a pastry blender, 2 knives, or your fingertips. The mixture should look like coarse crumbs. Stir in the diced peaches and almond slices. Whisk the buttermilk, egg, and vanilla together and gradually add it to the flour mixture. Stir just until the dough comes together. You may not need all the buttermilk. Add a little at a time until the mixture is moist but not too wet. Do not over mix the dough or the scones will be tough. Transfer the dough to a lightly floured surface and gently knead the dough four or five times. Pat the dough into a 7 inch round circle. Cut the circle in half, then cut each half into four triangle shaped wedges. Arrange the scones 2 inches apart on a baking sheet lined with parchment paper. Place the scones in the freezer for 30 minutes. Meanwhile, position the oven rack in the center of the oven and preheat to 400°F. Remove the scones from the freezer and brush the tops with milk or cream. Bake for 15 to 20 minutes or until golden brown. Transfer to a wire rack to cool. Top with glaze and serve immediately. Combine the ingredients for the glaze in a medium bowl. Whisk until smooth and spreadable. Scones will keep for up to 2 days stored in an airtight container at room temperature. Scones can be frozen for up to 3 months. Thaw in the refrigerator overnight. *Buttermilk works best for this recipe but regular yogurt will also work. Try using peach yogurt for more peach flavor. 1. The scones need to be cold when going into the oven. Placing the shaped dough into the freezer for 30 minutes ensures the scones will bake up light and fluffy. 2. Alternatively, you can place the scone dough in the refrigerator for at least 2 hours. This recipe yields 8 large scones. For smaller scones, cut the dough into 16 pieces instead of 8. Watch the scones closely as they bake because smaller scones may require a shorting baking time.